From mid to late September, Highway 61 from Duluth to Grand Portage churns with vehicles bearing fall color groupies rushing to catch the fall color before it peaks. This year, road repair interrupted their race northward, releasing long lines of vehicles in batches from enforced delays. They speed off like headstrong students only to encounter another enforced delay several miles up the road. Unable to race to anything-- hampered not by traffic, but by a fractured pelvis – I was forced to get my fall color fix in smaller doses: the aspen shimmering gold through the living room window, the wild honeysuckle in its ocher and red march across our hillside, the hoard of hungry cedar waxwings devouring the lush berries on our mountain ash trees. On September 21, Bill drove me up the Cramer Road known for its flaming maple arch where I could peer into and under the forest canopy. It feels as if I am standing within a stained glass cathedral. In the past, we've tried to capture the full sweep of mountains on fire with color, but the sights we remember most clearly are views of those mountains as seen through an iridescent film of translucent leaves or the vision of a single orange maple flirting between dark green spruces. Not everyone is satisfied with such miniatures, however. On September 23, Bill encountered a photographer marching grimly along the Oberg Loop. “Isn't it glorious?” Bill enthused. “Hell, no,” the photographer grouched. “It’s past peak. A waste of my time.” Bill wondered how he could have missed the color through which he was walking. Emily Dickinson captures, in few words, what I've been trying to say in two paragraphs and what we witnessed this morning. I'll tell you how the sun rose -- / a ribbon at a time. I've begun rereading Learning to Fall: The Blessings of an Imperfect Life by Phillip Simmons, a brilliant young author who died at the age of 35 from ALS. Simmons brings warmth and even humor to these essays written as the disease drains what is left of his life. When I grouch about the things a fractured pelvis makes downright difficult if not impossible, Simmons reminds me that there is beauty to be experienced now, perhaps in this very inconvenience. I keep going back to this book, learning how Simmons came to terms with his disabilities and finding within its pages insights into how to deal with my own. In one of his final chapters, Simmons writes, “Now I find myself in late August, with the nights cool and the crickets thick in the fields. 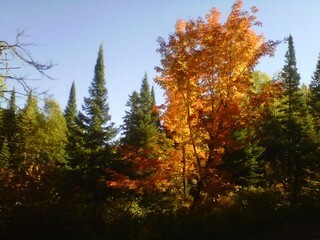 Already the first blighted leaves glow scarlet on the red maples. It’s a season of fullness and sweet longings made sweeter now by the fact that I can’t be sure I’ll see this time of the year again....” Updates on the Sequel to the Scent of God The Glass Calyx: a Mother’s Journey to Forgiveness is now with a trusted final reader and then off to an editor. Of course, as I wait, I’m stricken with all sorts of insecurities. Have I really told this story? Can I really tell this story? Will the reader want to read this story? Enjoy what's left of fall and may winter prove a kinder relative this year.